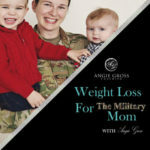 Welcome to the 3rd episode Weight Loss For The Military Moms Podcast. In this week’s episode, I talk about the “funk” I found myself in. It was literally debilitating. I had no motivation. I was white knuckling all the action I was taking. I couldn’t seem to get out of it, until I had a session with my coach. It left me paralyzed in both my weight loss journey and my business. I hit a platue and I made no progress. So what do you do when you get into that funk? Listen to this weeks podcast and I will tell you what to do.